We have a ready stock of a wide variety SS tapered tube plug to cater your huge requirement.solitaire overseas is known for providing high-quality Stainless Steel tapered tube plugs and for its quick and timely delivery. We export and supply SS tapered plugs all over the world. We have been a leading and the most trusted company providing high-quality Stainless Steel (SS) tapered plugs for heat exchangers, coolers, boilers, condensers, etc for decades. Stainless Steel Tapered Plugs For SS 304 Tubes, SS 304L Tubes , SS 304H Tubes, SS 310 Tubes, SS 310S Tubes, SS 316 Tubes, SS 316L Tubes, SS 316H Tubes, SS 316Ti Tubes, SS 321 Tubes, SS 321H Tubes, SS 347 Tubes, SS 347H Tubes, SS904l Tubes, Duplex Tubes, Super-duplex Tubes, Duplex 31803 Tubes, Duplex 2205 Tubes, Super Duplex 32750 Tubes, Super Duplex 32760 Tubes, SMO 254 Tubes. Stainless Steel Tapered Plugs For Heat Exchangers Are Used To Seal The Leaking Tubes In Heat Exchangers, Condensers, Boilers, Coolers, Stainless Steel Tapered Plugs For SS 304 Tubes, SS 304L Tubes , SS 304H Tubes, SS 310 Tubes, SS 310S Tubes, SS 316 Tubes, SS 316L Tubes, SS 316H Tubes, SS 316Ti Tubes, SS 321 Tubes, SS 321H Tubes, SS 347 Tubes, SS 347H Tubes, SS904l Tubes, Duplex Tubes, Super-duplex Tubes, Duplex 31803 Tubes, Duplex 2205 Tubes, Super Duplex 32750 Tubes, Super Duplex 32760 Tubes, SMO 254 Tubes. Etc. Stainless Steel Tapered Plugs Offers Low-Cost Maintenance And Fastest Method To Seal The Leaking Tubes. The Uniform Taper And The Smooth Surface Finish Of Stainless Steel Plugs Assure Positive Sealing With Minimum Installation Force. Stainless Steel Tapered Plugs For Heat Exchangers Are Used To Seal The Leaking Tubes In Heat Exchanger, Condensers, Boilers, Coolers, SS 304L Tubes , SS 304H Tubes, SS 310 Tubes, SS 310S Tubes, SS 316 Tubes, SS 316L Tubes, SS 316H Tubes, SS 316Ti Tubes, SS 321 Tubes, SS 321H Tubes, SS 347 Tubes, SS 347H Tubes, SS904l Tubes, Duplex Tubes, Super-duplex Tubes, Duplex 31803 Tubes, Duplex 2205 Tubes, Super Duplex 32750 Tubes, Super Duplex 32760 Tubes, SMO 254 Tubes.Stainless steel is used in constructions, automobile, refrigerators, coolers, heat exchangers, coolers, condensers, etc. We are one of the leading exporters, suppliers, and stockists of Stainless Steel tapered plugs. Having a stock of more than 10000 Stainless Steel tapered plugs, we can deliver a huge quantity of Stainless steel tapered tube plugs as and when required. we have a production capacity of more Than 1000 SS tapered plugs a day so that we can cater to your large requirements. Stainless Steel Heat Exchanger Plugs, Stainless Steel Tapered Tube Plugs Exporter & Supplier, Stainless Steel Plugs Exporter & Supplier, Stainless Steel Tube Plugs Stockist And Exporter. Why Are Stainless Steel Tapered Tube Plugs Used In Heat Exchangers ? Stainless Steel Tapered Tube Plugs For Heat Exchangers Are Used To Seal The Leaking Tubes In Heat Exchangers, Condensers, Boilers, Coolers, Etc. 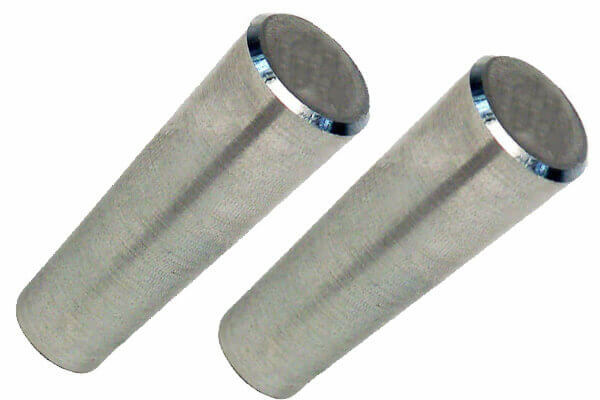 Stainless Steel Tapered Tube plugs are used extensively in heat exchangers . they are used for repairing or fixing leaks heat exchangers. Stainless Steel Tapered Plugs offer low-cost maintenance and are highly efficient, Stainless Steel Plugs offer the fastest way to fix leaks in heat exchangers. We have wide variety of stainless steel plugs. We are one of the leading exporters, suppliers and stockists of tapered plugs. Having a stock of more than 10000 Stainless Steel tapered tube plugs, we can deliver a huge quantity of SS tapered tube plugs as and when required. we have a production capacity of more Than 1000 SS Tube plugs a day so that we can cater to your large requirements. We have a ready stock of SS Tapered Tube plugs of different materials like Stainless steel tapered plugs, stainless steel tapered plugs, titanium tapered plugs, alloy steel tapered plug, Inconel tapered plugs, monel tapered plugs, tantalum, hastelloy , copper and copper alloys, nickel and nickel alloys tapered plugs, copper-nickel tapered plugs, etc. available in different sizes.with ready stock of stainless steel tube plugs and huge production capacity we provide fastest delivery and quality stainless steel tapered tube plugs to our customers. We even cater to small requirements of our customers. Our SS tapered plugs are exported all over the world to many industries. Why Choose Solitaire Overseas To Buy SS Tapered Plugs and Tubes? Looking For Exporters & Suppliers Of Stainless Steel Tapered Tube Plugs? Come Right To Us!